Wouter Duivesteijn is a former member of the ADA group. He is currently a post-doctoral researcher at the TU Dortmund. Wouter was a Ph.D. student in the ADA group from September 2009 to June 2013. 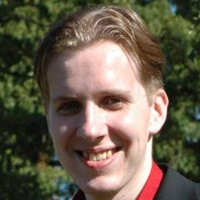 For years Wouter claimed to be a mathematician who also happens to do computer science. After receiving his Master's degrees with a final thesis on a data mining subject, he finally converted to computer science in 2009, when he became a Ph.D. student in the Algorithms group of LIACS. Each week he spend two days in the ADA group. Wouter worked on the NWO Exceptional Model Mining (EMM) project. EMM is a framework that can be seen as a generalisation of Subgroup Discovery (SD). Both SD and EMM attempt to find small portions of the data where the observed behaviour is notably different from that of the database as a whole. But, whereas in SD `behaviour' is traditionally interpreted in terms of the distribution of a single nominal variable, EMM seeks subgroups for which the fitted local model is surprisingly different from the global model. In this approach, `behaviour' is described by a number of attributes, and fitting a model captures the multivariate dependencies between these attributes.